Grand Central Market | Press Coverage | Eater LA | By Farley Elliot Eater LA presents Hot Take, an off-the-cuff look at a classic or must-know spot in Los Angeles. This first one comes via senior editor Farley Elliott, just in time for breakfast week. Eater LA presents Hot Take, an off-the-cuff look at a classic or must-know spot in Los Angeles. This first one comes via senior editor Farley Elliott, just in time for breakfast week. Here’s a theory: China Cafe is the best place to eat breakfast at Grand Central Market. Stick with it for a second. Yes, yes, there are places like Wexler’s and Knead & Co. and Horse Thief doing weekend breakfast tacos, but how consistently do you really eat at any of them? Contrast that with the never-an-empty-seat mentality of China Cafe, where housewives take buses every day in order to sit down with friends and chow; where construction workers are elbowing for room with lawyers and produce market vendors no more than an hour or two after the sun has come up. The counter-only stalls opens at 9 a.m. sharp, is packed to the rafters by 9:01 a.m., and by 9:05 a.m. a semi-formal waiting queue has formed around the padded counter seats. Find another stall, with the possible exclusion of Eggslut, sporting that many morning fans. Spanning just 22 seats in an open U shape, China Cafe is nearly 60 years old. Now run by Susie and Rinco Cheung, the eatery maintains essentially the same menu now as it always has — a mix of Chinese-American favorites like chow mein and chop suey, plus noodles, fried rice, and the ubiquitous egg foo yeung. And then there’s the won ton soup, a primally satisfying bowl that remains the most sought after single dish at China Cafe. Flecked with dried chile flakes and plump wontons, the soup is bright and fresh and immensely popular all day long. Yes, you should eat it for breakfast. And why not? There are plenty of other cultures who know that breakfast doesn’t necessarily begin and end with bread and eggs. You can even drink at China Cafe — something not even Eggslut can beat. 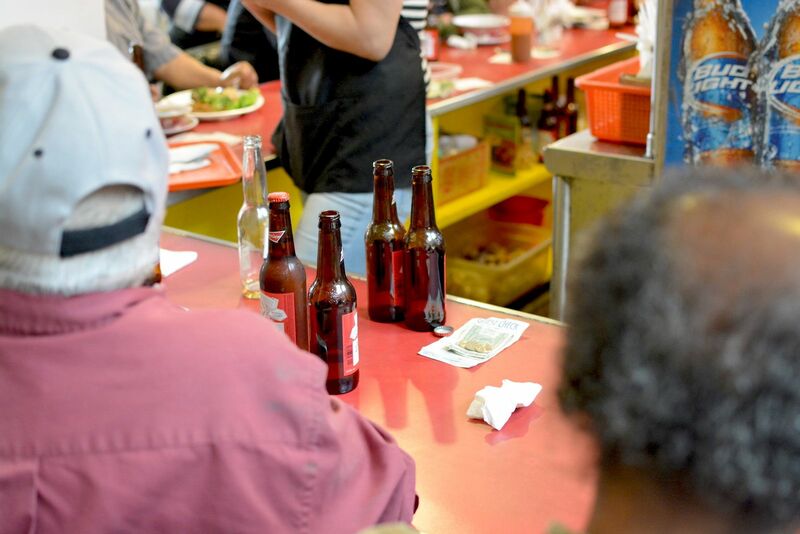 Bottles of Budweiser and Corona start piling up on the red formica countertop soon after opening, and don’t cease until the cafe closes down again at 6 p.m. Forget boozy champagne brunches with decadent weekend price tags; you can get a different (and some might argue, better) version of that world seven days a week at one of Grand Central Market’s oldest stalls. And the clincher of it all is this: You get to make China Cafe what you want. Prefer a cup of specialty coffee instead of a morning beer? Great, bring it on over from G&B just across the way. Love some plantains or Mexican spices with your morning noodle plate? Grab some from nearby and drop it in the mix, no questions asked. China Cafe will let you linger with morning pals or eat and leave in under 20 minutes if you’d like. 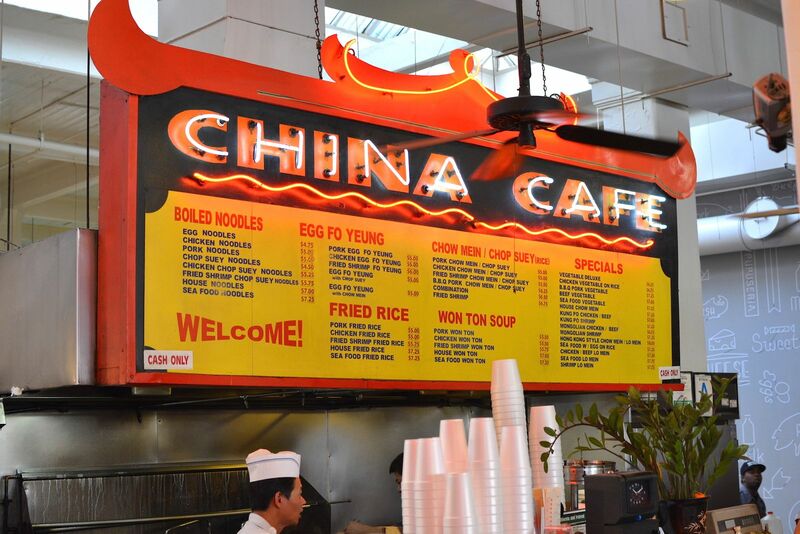 You can have it all at China Cafe, including a touch of nostalgia at one of the oldest remaining market vendors. And if you want some scrambled eggs or a creamy morning polenta just to break up the monotony of morning won ton soup? Sure, make your way through the rest of the market and you’ll find what you’re looking for. Just don’t be surprised if you end up back at China Cafe some morning, waiting in line with everyone else for a chance at a plush black counter seat and some won ton soup. It’s the way generations of morning diners have been doing things around those parts, since 1959.